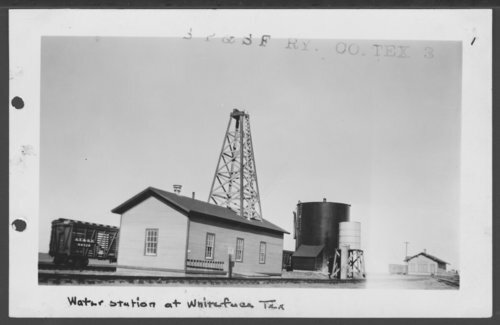 This black and white photograph shows the South Plains & Santa Fe Railway Company water station in Whiteface, Texas. The facility was a subsidiary of the Atchison, Topeka & Santa Fe Railway Company that ran from Lubbock, Texas to Bledsoe, Texas. In the background a box car and a depot is visible.